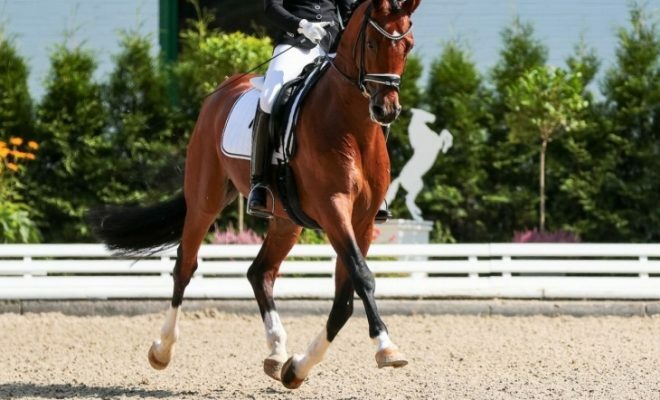 The very mention of sitting trot is enough to make many riders cringe. 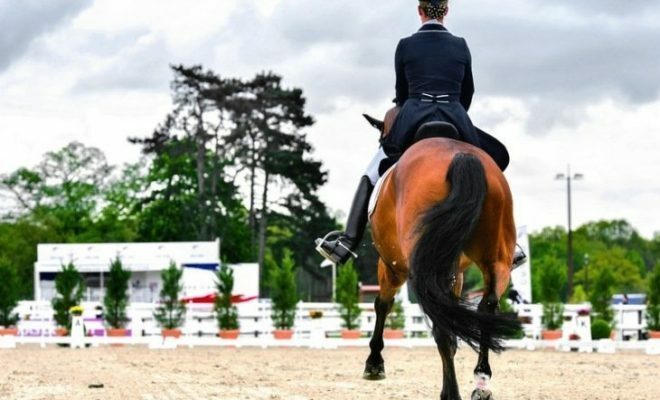 Although sitting trot is not actually required in dressage tests until you reach medium level in British Dressage, your seat is a very useful and effective aid to be used in combination with your rein and leg. Therefore, it’s worth learning how to ride sitting trot properly, without inflicting pain on either yourself or your horse! Here are some tips to help you improve your sitting trot. The fundamentals of a good sitting trot are balance, relaxation, and the ability to follow the horse’s movement without interfering with his natural rhythm. In order to master the technique, you must be able to move your pelvis correctly, and you can begin to learn how from the ground. Stand with your back flat against a wall. 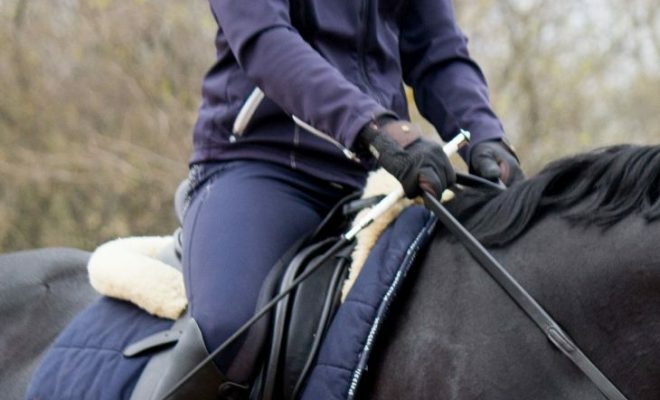 Place your feet apart (about the distance they would be if you had a horse between them) and slightly bend your knees, again approximating the leg position you would have in the saddle. Now push your tummy backward until your whole back touches the wall. Take note of the muscles you use to do this, avoiding any contraction of your buttocks. This is the point where women realize they have a natural arch in their lower backs that may make this difficult. Men have a much straighter spine, so find this easier to achieve, but the principle is still the same. Note the muscles you use to flatten out that lower back because those are the ones that you need to use when swinging your pelvis correctly while sitting adhesively in the saddle. The next essential component is, understanding how to stabilize your core. Again, off the horse, stand upright with your elbows bent and hands in position as if you were holding the reins. Extend your spine upward, as if there was a string attached to the top of your head pulling you up like a puppet. Picture your vertebrae stacked in a vertical column with as little arch in the lower back as possible, as in the exercise above. Now have a friend take hold of your elbows and pull down on them. The opposing forces of your upward stretch and the pull-down of your elbows will give you the experience of engaging your core muscles. Finally, replicate that same feeling without the added assistance. This is the feel your upper body should have when you are riding. Find someone to lunge you on a steady horse. 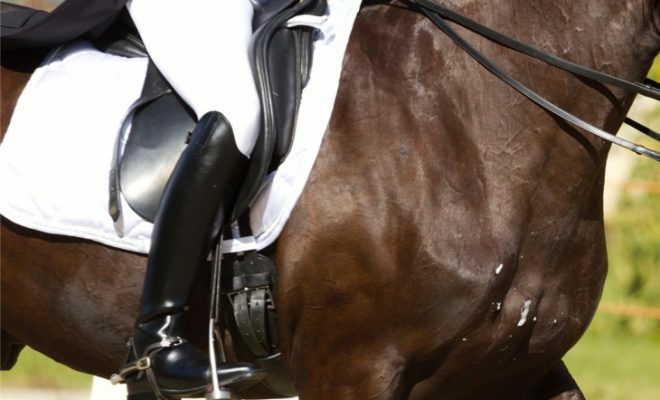 Take hold of the pommel of your saddle with both hands. Slightly lean back and lift both legs a little up and out until only your seat is in contact with the saddle. Feel how your pelvis moves – there is an upward/forward swing to the front (the crotch) that you need to replicate once you replace your legs into normal position. For a moment, allow your legs to dangle limply. Feel how much less stable you are in the saddle. The correct leg position, with flexed hips, knees and ankles is correct for good reason – without tone in the muscles that flex those joints, the seat is de-stabilized. Remember to maintain that leg position as part of your efforts to improve your sitting trot. Having felt the correct swing of your pelvis and recreated the feeling in all the muscles mentioned above (core and legs), the best advice is to develop a passive seat that allows you to follow the horse’s movement without disrupting or influencing his rhythm. Once you’ve mastered this, you can begin to use your seat as a stopping or driving aid. Finally, concentrating too hard on just performing a good sitting trot is often less successful than actually riding the horse. When you ride off the lunge without your stirrups, ride school movements, rather than just going round and round trying to sit perfectly. Keep your practice sessions short; remember that your horse is not a piece of gym equipment! The key to developing a good sitting trot is learning to move your pelvis correctly. This will enable you to sit relaxed and in balance with a good independent seat. Practice developing your core strength on the ground, and keep mounted practice sessions short so as not to make your horse’s back sore. In the early stages of his training, your horse will be much better able to use his back if you go rising in the trot work. 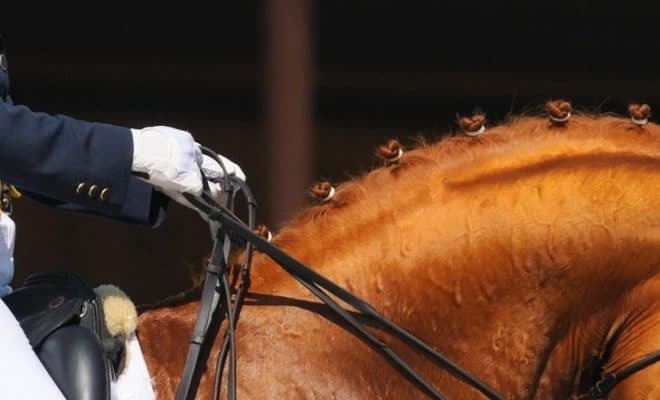 Don’t insist on sitting just because you’re riding a dressage test. 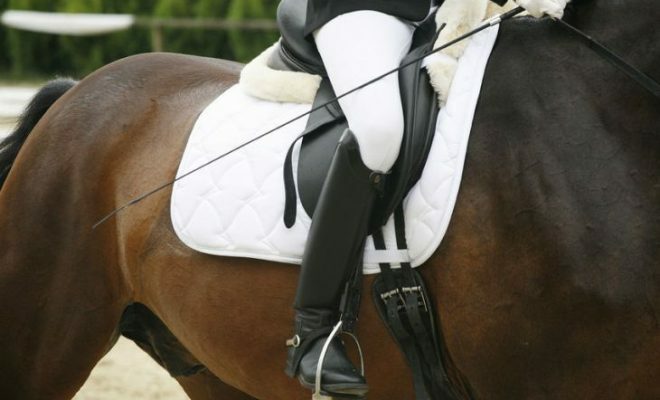 Your marks will be higher if your horse is working forward over a swinging back into a relaxed and quiet contact.